Our Music Ministry purpose is to share the gospel of Jesus Christ through music and to touch hearts through the experience of song. Our organist and choir lead the congregation in heartfelt musical worship to give Glory to God. The congregation sings songs of praise, thanksgiving and consecration from our songbook with selections from across the decades. You may enjoy traditional hymns played on the organ, contemporary songs played on the piano, and guest string or wind instrument soloists. We “make a joyful noise unto the Lord” (Psalm 98). The choir members sing because they love music, they enjoy the fellowship, and it is a rewarding way for them to use their natural gifts to praise God. The choir practices on Thursday nights from 7:00pm to 8:30 and Sundays at 9:15am, and sings each Sunday from September to June. In the summer, we enjoy the musical talents of vocalists and instrumentalists. Youth of all ages are invited to sing during service various times throughout the year. 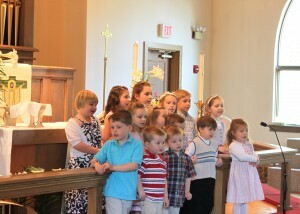 The children (ages 5-12) sing together, as do the teens (ages 12-18) on important holidays such as Reformation Sunday, Christmas, Transfiguration, Palm Sunday, and Pentecost. The teens help to pick contemporary Christian rock songs that fit the celebration. Rehearsals are after service on the Sundays leading up to the celebration. All are welcome! Rehearsals – After service on, Oct. 7, 14, & 21. Before service on Oct. 28. Before service on June 9. For almost ten years our Music Scholars program has been a wonderful way to connect local high school and college students with our worshipping community. Each year several students, who receive a stipend to support their studies, add their talented voices to our adult choir. What: Vocalists are needed to enhance our church choir. Payment is $20 for a rehearsal and $25 for a service. When: Rehearsals are Thursday evenings from 7:00-8:30 pm. Church services are Sundays at 10am with a 9:15am rehearsal. The choir only meets during the school year. Regular attendance is expected, but if you need to miss, we are understanding. Why: Gloria Dei enjoys supporting young people with a professional and fun music opportunity that contributes to an inspiring worship service for our congregation.